Dewalt Heavy Duty XRP™ 1/2 in. (13mm) 18V Cordless Hammerdrill/Drill/Driver w/Vehicle Charger Kit. 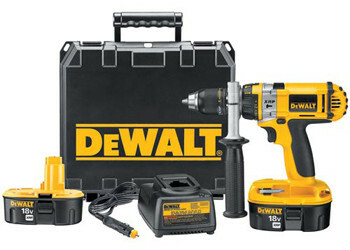 DEWALT built high torque motor delivers 500 in-lbs of maximum torque. Patented 3-speed transmission features a max 3rd speed at 2,000 rpm. Hammerdrill mode: 34,000 bpm drills faster holes in masonry applications. 1/2" metal ratcheting chuck with carbide jaws helps to prevent bits from slipping. Superior ergonomics provides optimal balance, comfort and control.